IBM Information Server is a revolutionary new software platform that helps organizations derive more value from the complex heterogeneous information spread across their systems. It enables organizations to integrate disparate data and deliver trusted information wherever and whenever needed, in line and in context, to specific people, applications, and processes. IBM InfoSphere™ DataStage® is a critical component of the IBM Information Server, and the parallel framework of IBM InfoSphere DataStage is also the foundation for IBM InfoSphere QualityStage and IBM InfoSphere Information Analyzer components. 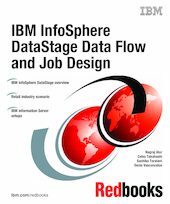 This IBM® Redbooks® publication develops usage scenarios that describe the implementation of IBM InfoSphere DataStage flow and job design with special emphasis on the new features such as the distributed transaction stage (DTS) in Version 8.0.1, slowly changing dimensions stage ( Version 8.0.1), complex flat file stage (Version 8.0.1), and access to mainframe data.